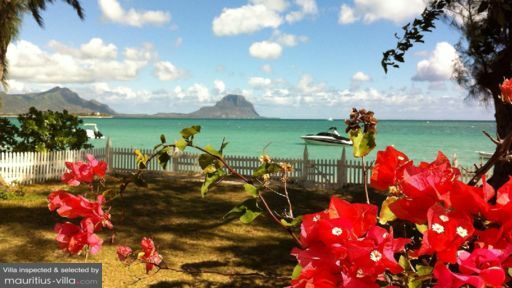 Villa Plage is a bungalow-type, beach-front vacation residence just along the white-sand shores of La Preneuse that stretches on the west of Mauritius. The villa exudes a homespun and, to a certain extent, rural feel reflected in its mostly woody and retro furnishings, décor, architectural touches as well as design accents. With its old-fashioned and, perhaps, even nostalgic appeal, Villa Plage truly embodies the classic style and romance of living by the sea. The villa has three bedrooms. The master bedroom has a king-sized or queen-sized bed and a dedicated bathroom. It also has direct access to the covered terrace. The second bedroom has a double bed. It also opens out to the garden. The third bedroom has twin beds and also shares a bathroom with the second bedroom. 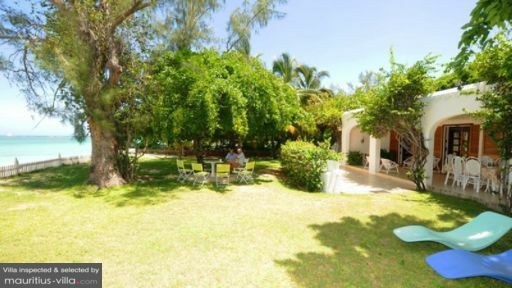 The villa’s expansive, grassy outdoors is bordered by a low, vintage, white picket fence that opens out to the beach. After your morning dip in the ocean, you can choose to stretch out on cushioned sun beds to get a tan. Or, chill out on the mono-block bench as well as on white and lime folding chairs under the shade of giant trees while looking out to the sea and to the mountain of Morne with its oddly-shaped summit. A floral-fringed patio and three arched entryways all lead to the covered terrace. On the glass-topped table with six white-colored, wooden chairs you can all heartily enjoy lunch. Then during the slow and balmy early afternoons, you can all lazily pass the time on white-painted local, wooden furniture until it’s cool enough for another swim at the beach. On windy evenings, you can throw a barbecue beach party at the covered terrace and the garden’s extensive grounds. Indoors, through wood-framed doors from the covered terrace, is the living area. Here, you can all sit around the long couch and the cushioned, native, wooden furniture for some lively storytelling. Or, you can catch your favorite show then watch, once again, your best-loved, classic movie all on satellite TV. Right across is the dining area. On its wooden picnic table, you can all sample authentic Mauritian cuisine – as well as simple western dishes – carefully put together by the housekeeper on duty at the villa’s fully-equipped, modern kitchen. Housekeeping – as well as cooking assistance – are available from morning till noontime, Mondays to Saturdays. After getting your saltwater fix at La Preneuse, dine on the beach at the Bay Restaurant and have your fill of delicious seafood, steaks and desserts. On another occasion, feed your curiosity with a visit to the Museum of La Tour Martello. Then satisfy your shopaholic cravings at the Ruisseau Créole Shopping Center. Head back to the water the very next day. Swim with dolphins. Go big game fishing at the Black River, kite surfing near Morne Mountain, as well as surfing and stand up paddling at Tamarin Bay. You also mustn’t miss out on the inland attractions such as the Black River Gorges, Morne Mountain – a UNESCO World Heritage Site, the Seven Cascades, the Terres of the Seven Colors, and a wildlife safari. But if you prefer something less extreme, there’s also golf and karting. We loved this villa and it served our needs beautifully. Location...doesn't get any better! Cleanliness - excellent and serviced daily, the chef cooked us a delicious curry when we asked. The hostess was always available and explained things to us very clearly. It worked wonderfully well for us as a self-catering option with the shops within a 5-minute drive (or longer walk). Excellent amenities. We dined out at Mama Helene's in Flic-en-flac: fabulous intimate Creole dining experience and accommodating of children too. Good rates on car hire from S&F Car Rental in Black River.